Over the 25th a prescreening of the upcoming Cardfight!! Vanguard film, Neon Messiah, was held in Japan, and spoilers for the movie were leaked through Twitter by some of those attending. According to this information, the film's key antagonist Ibuki Kouji will be voiced by celebrity voice actor Miyano Mamoru, known for his past roles as Yagami Light in Death Note and Setsuna F. Seiei in Mobile Suit Gundam 00. 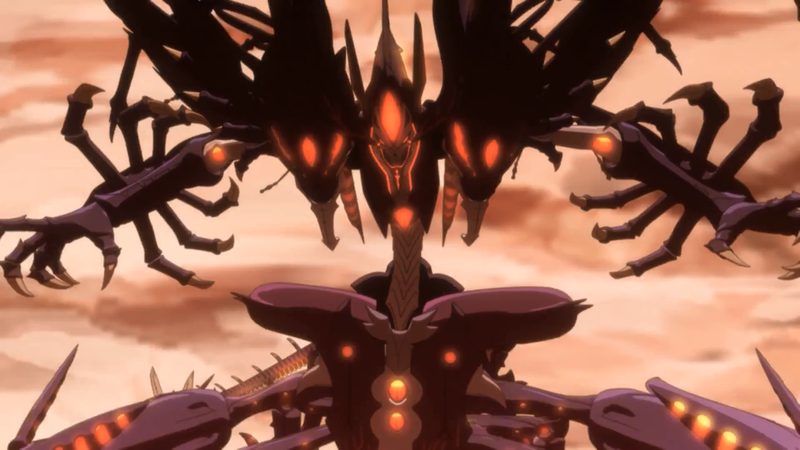 From these same sources, the Kagerou grade 3 Dragonic Overlord is to receive a Legion remake in the film as Dragonic Overlord the Great (ドラゴニックオーバーロード・ザ・グレート Doragonikku Oobaaroodo Za Gureeto.) His mate has not been made public. Furthermore, as Neon Messiah is stated to be a general-interest film, card effects in the movie are not gone into in-depth. Warning: Spoilers for Neon Messiah follow. The veracity of this information cannot be wholly confirmed. 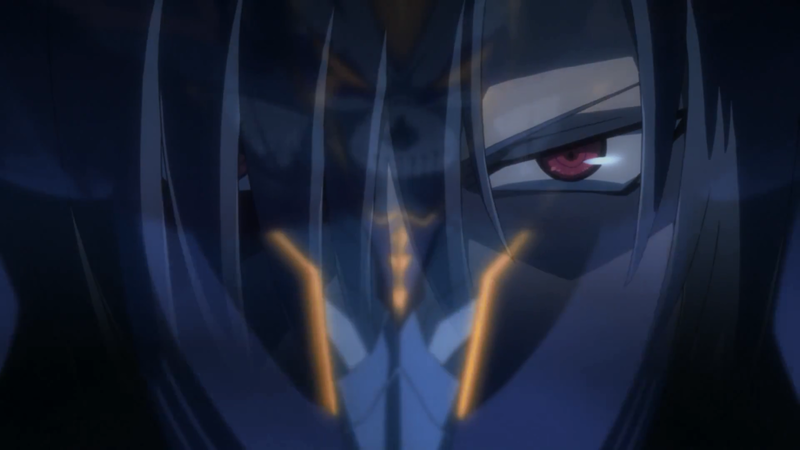 The film's protagonist is said to be Sendou Aichi, returning after his long absence this past season, while the heroine is Tokura Misaki, and Kai Toshiki serves a supporting role. According to these leaks there are at least seven fights in the film; Leon vs Gaillard (Leon's victory), Misaki vs Christopher Lo (Misaki's victory), Katsuragi Kamui vs Philip Neve (Kamui's victory), Kai Toshiki vs Mitsusada Kenji (Kai's victory), Sendou Aichi vs Ibuki Kouji (outcome unclear; Blaster Blade is deleted by Ibuki's Wokshyz but the rest of the Royal Paladins are safe), Leon and Misaki vs Ibuki (Ibuki's victory) and Aichi vs Tatsunagi Takuto. This last fight is said to be a battle to undelete Blaster Blade, involving Aichi's power of PSY Qualia. These users did not mention the apparent finale featured in the most recent trailer, where Aichi confronts Ibuki alongside Kai, nor Ren's fight with Ibuki hinted at in the same. 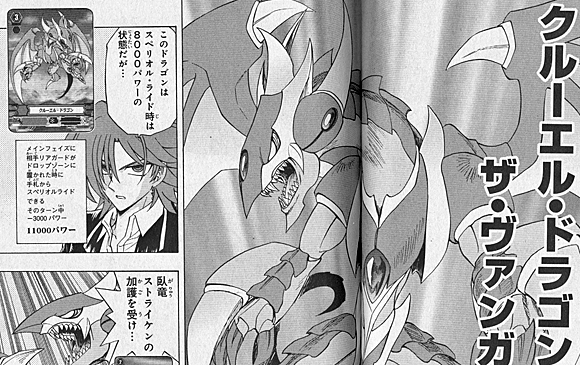 The return of Takuto has come as a shock to many, as fans were under the impression that Takuto would not be returning after his departure in Link Joker. The character in general has been poorly received in the past, with his status among fans comparable to Tingle of the Legend of Zelda series. 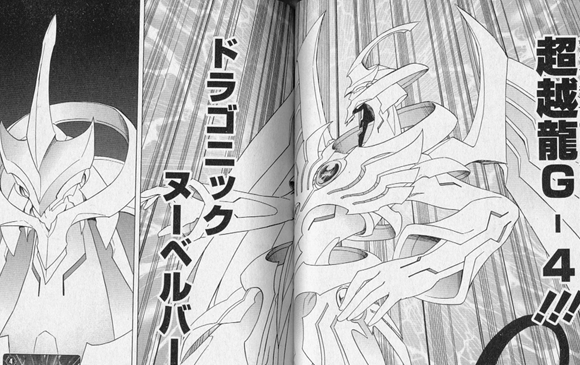 The titular Messiah are said to be a pair of grade 0 and grade 4 cards, with the 0 as the Neon Messiah. The name of the grade 4 unit is Harmonics Messiah. 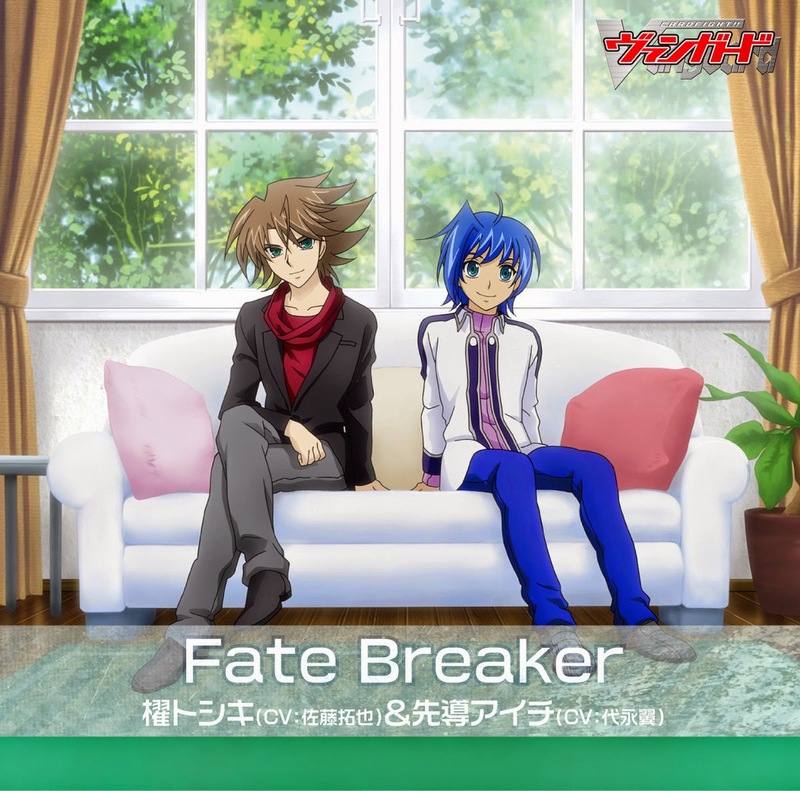 Aichi and Kai allegedly sit on a bed in one scene of the film; this is likely a form of fanservice in reference to the album cover of their previous duet character song, Fate Breaker. Aichi is also said to take off his shirt for one scene. "A Deleted Unit is flipped face-down, its Power becomes 0 and it loses all Text. At the end of its owner’s turn, it is flipped face-up." The official Japanese portal updated early this morning with information on the upcoming mechanic introduced in VG-MTD01: Malefic Deleter, delete. Featuring the trial deck's cover unit Daunting Deleter Wokshyz as the card of the day, this unit is at present the only one capable of inflicting a delete. Wokshyz separates the cardfighter's astral body from their vanguard by deleting it, forcing the player to fight as themselves without their main unit to protect them. Fitting this idea, once deleted the vanguard turns face-down and has its power reduced to 0, reflecting the native weakness of the player's astral from. All of the vanguard's skills are removed, and if the vanguard is in a Legion then both halves of it will be affected. Like a locked card, the vanguard turns face-up at the end of its owner's turn. The massive power reduction effectively strengthens the entire Deleter cardfighter's field by 11000 power and negates the effects of crossrides, while also decreasing the amount of shield they will need to spend on defending the next turn and preventing strong comebacks from limit break and Legion skills. However, because the vanguard retains its name, grade, clan, nation and critical it will still have twin drive if at grade 3, activate the rearguards' subclan-related skills and be able to deal damage if its attack goes through. That fighter's soul still remains a usable resource, and the delete can be partially bypassed by riding over the deleted unit, but if the deleted vanguard was a break ride then its limit break will not activate because it still deleted at the moment that it is ridden. Requiring three especial counterblasts for its main skill means that none of the pre-Malefic Deleter support is compatible with Wokshyz, forcing Link Joker cardfighters to find a fresh start in the trial deck and Neon Messiah booster set. As an offensive incarnation of Link Joker focused on dramatically weakening the opponent in order to strip them of their abilities just long enough to win the game, the deletion strategy stands in contrast to their past defensive play style. Accounting for those differences, delete can be expected to attract completely different kinds of cardfighters from lock. MTD01: Malefic Deleter and MBT01: Neon Messiah are both due for September 24th release date in Japan, with a limited theatrical release on September 13th. 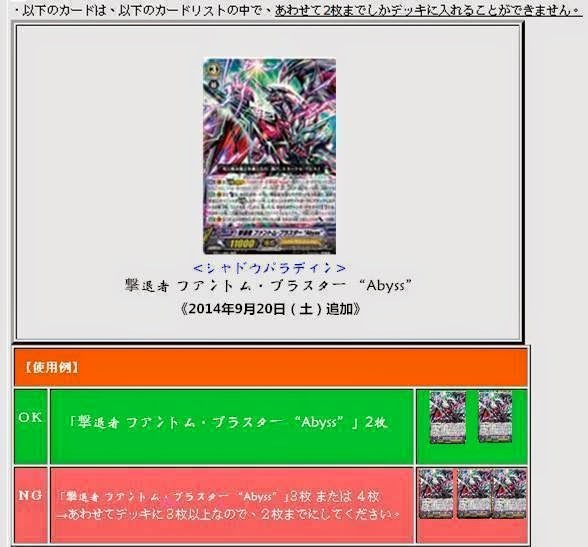 A falsified restricted list for the Japanese format began circulating on Facebook this morning, garnering significant attention for showing the alleged restriction of Revenger Phantom Blaster “Abyss” to two copies per deck. PhotoShopped to appear as though it were screencapped from the Japanese Fighter's Rules page, several errors exposed the list as fake. While the most obvious is that the Japanese Fighter's Rules do not show the restriction, the forgery also shows decentered card images in its examples of how “Abyss” was to be used. Real Bushiroad restricted lists sample card images from their online card index, and fits the images into an HTML template that centers them between borders, so that they do not touch the top or bottom of the OK and NO boxes. Another giveaway is the name of the card at the list's heading, which in real restricted lists hyperlinks to its entry in Bushiroad's card index. Selected comments. Names removed for privacy. As the falsified list has not been discussed by Japanese cardfighters on any of their major forums or within their blogosphere, the hoax is believed to have originated in the American fandom. While doubtless based on the overwhelming success of Thing Saver-“Abyss” decks in Japanese play, judging by the responses from English-speaking fans the intention of the prank is to play on the rising tensions between the players and Bushiroad Inc. Restricting “Abyss” is a move that virtually no experienced cardfighters would agree with, as many believe that Thing Saver itself should be targeted to curb the hybrid deck's dominance, and shutting down the Revengers' current core Legion would be throwing the baby out with the bathwater. 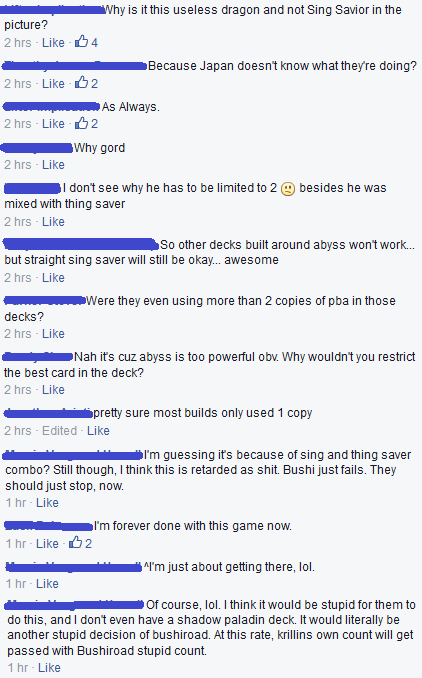 The forgery is a commentary on the perceived incompetence of Bushiroad in managing the card game, showing something fans believe the company would do. Tensions have been running high between both parties for the past two years, particularly in light of Future Card Buddyfight receiving a best-of-three competitive format with a 40 minute time limit for its World Championship, while Cardfight!! Vanguard is still restricted to the popularly-despised best-of-one format with a 20 minute limit. WCS2014's new time rule has worsened matters, as it causes both cardfighters to lose the round if they hit the time limit. The distrust among cardfighters has also been tempered by Bushiroad's perceived willful ignorance of cheating, and refusal to investigate standing world champion Almeida Stewart after accusations surfaced alongside news of his robbery of a Luxembourg card shop during Team League 2014. 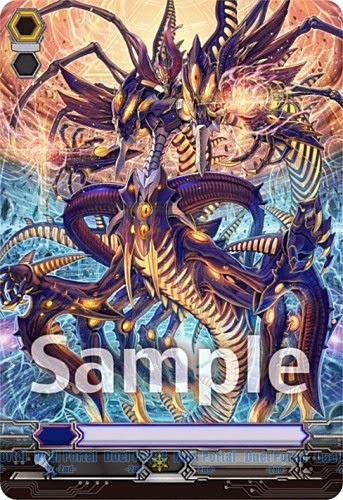 In Japanese news, a recent release from Duel Portal has revealed three of the upcoming card sleeves for Bushiroad's Cardfight!! 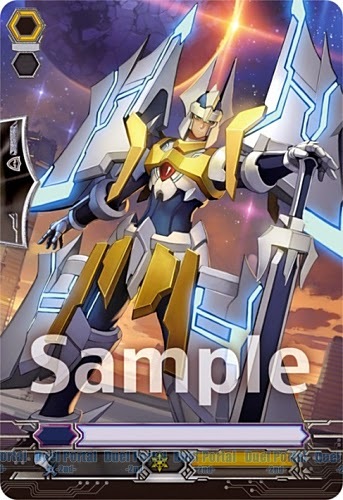 Vanguard sleeve collection, based on the key cards featured in the September film Neon Messiah and in one of the upcoming cards from the anime series to be released in the film's accompanying booster set. First is Daunting Deleter Wokshyz (威圧する根絶者 ヲクシズ Iatsusuru Deriitaa Wokushizu) the cover card for VG-MTD01: Malefic Deleter. 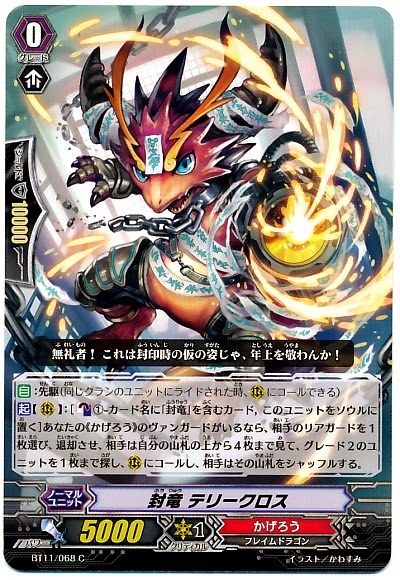 According to Duel Portal, the intended reading for this name is Daunting Deleter (ドーンティング・デリーター Doontingu Deriitaa) rather than the native reading of Iatsusuru "Overpowering." As Ibuki Kouji's key card, Wokshyz has been used prominently in promotional materials as the face of his personal variant on the Link Joker clan. Previously Wokshyz was thought to be Docking Deleter Graywon, Ibuki's key card from the manga to which it bears similarities, but now appears to be an alternate continuity equivalent in the same vein as Majesty Lord Blaster and Exculpate the Blaster. Second and third are Light Origin Seeker Alfred XIV (光源の探索者 アルフレッド・エクシヴ Kougen no Shiika Arufureddo Ekushivu) and Star-vader Blaster Joker (星輝兵ブラスター・ジョーカー Sutaabeidaa Burasutaa Jookaa) representing cards from the Royal Paladin and Link Joker clans. The new Alfred has been noted to have a shield icon on its promotional mockup, normally not present on grade 3 units. 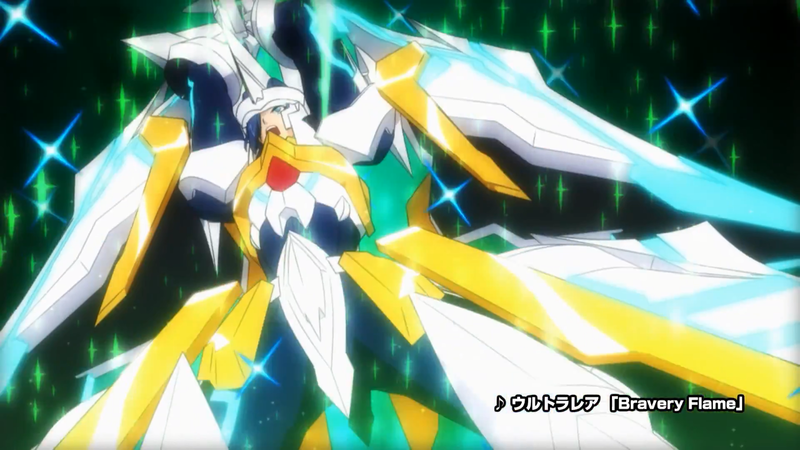 This contradicts the most recent trailer for Neon Messiah, wherein Alfred was shown as part of a Legion with one of the Blaster Blade variants, and implied to be a grade 3 as a result. While this discrepancy could be dismissed as the result of applying a nonspecific card template to Alfred, as was the case with Platina Ezel two years earlier, Wokshyz above notably does not have a shield icon despite coming out of the same press kit. Blaster Joker has been the focus of the most fan attention, as well as of attention from the card lore. 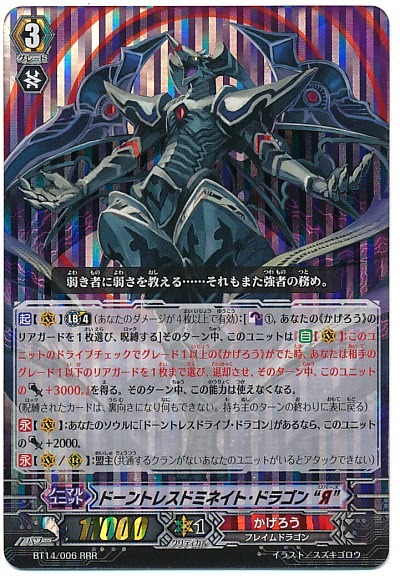 Although comparisons have been drawn with the Reverse units of the preceding season, Duel Portal's article indicated that Blaster Joker will be a Link Joker unit and not a Royal Paladin, and thus far the card lore has contradicted this view. 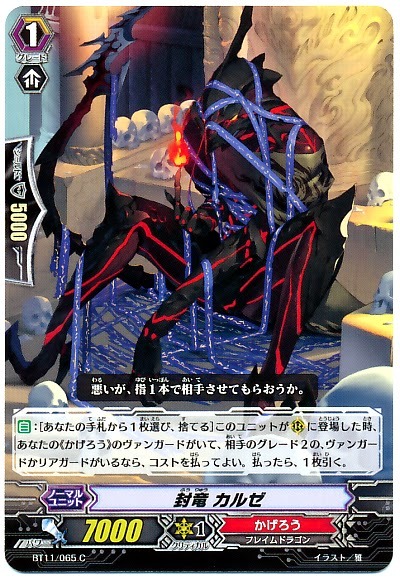 Blaster Joker is implied by Bushiroad's most recent articles to be an "Emotion Duplicate" like Star-vader Brave Fang (based on Wingal Brave) and Silent Star-vader Dilaton (based on Knight of Silence Gallatin) before him. These Duplicates are the products of copying the captive Blaster Blade's memories and using them as the basis for the personalities of newly created soldiers. Wokshyz's sleeve is due for a September 29th release date, while Alfred and Blaster Joker will go out on October 3rd. Meanwhile over the 17th the first Japan Fighters' Carnival was held, one of the few fan tournaments to use a three person team format. The top two places in the triples tournament went to two full teams of Thing Saver-“Abyss” cardfighters, while third was Brutus-Thing Saver, Purgatory Dragons and Brutus-Thing Saver. Fourth place was also filled by three Thing Saver-“Abyss” fighters. Decklists for the top 4 have not yet been published. Over the first day of the 86th annual Comiket, Bushiroad of Japan aired the third trailer for the upcoming pair of Cardfight!! Vanguard films The 3 Games and Neon Messiah, soon after making it available via YouTube. Both films were announced at this year's Great Vanguard Festival, with The 3 Games serving as the live action sequel to the 2012 live action drama starring Japanese musician and actor Daigo, and Neon Messiah as the followup to the currently-airing fourth season of the animated series, Legion Mate. 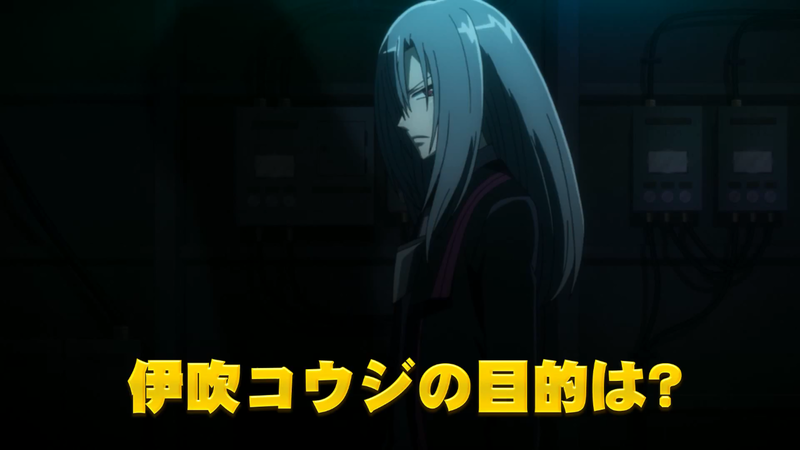 The previous trailer showed Sendou Aichi and Kai Toshiki's return to playing the Royal Paladin and Kagerou clans, as well as several of the upcoming fights in the film. This most recent trailer focuses on Aichi's new Legion card and the debut of antagonist Ibuki Kouji, a friend from Kai's childhood bearing the powers of Link Joker and its Deleter subclan. Due for a September 13th release date that will coincide with the upcoming 2014 World Championship qualifiers, the film is to be accompanied by the special booster set Movie Booster 01: Neon Messiah and the trial deck VG-MTD01: Malefic Deleter. The latter will feature Ibuki's core grade 3, Docking Deleter Graywon. Although once stated to be set between the Link Joker and Legion Mate chapters of the anime, the most recent announcements place the film after the fourth season. 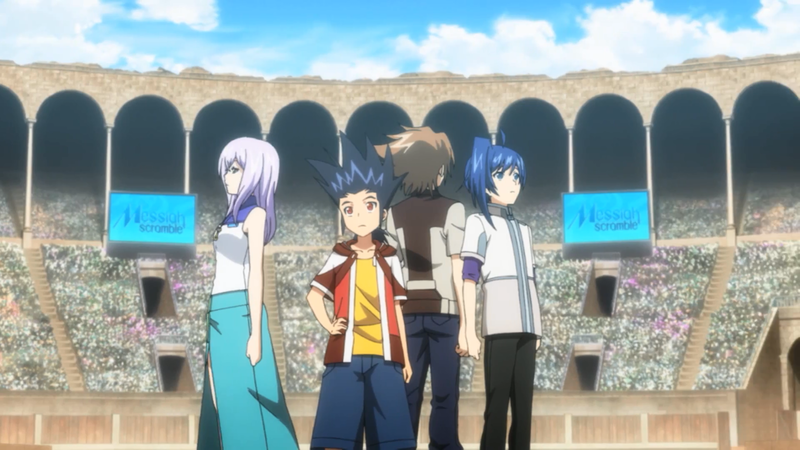 Neon Messiah is to follow Aichi and Kai as they enter the Messiah Scramble, a major tournament involving many of the series' previous characters. Amid this an "annihilation crisis" is emerges, causing the units on players' cards to vanish. Of note, the fighters shown in the trailer appear to have locked vanguards at the moment that their units disappear. As part of the Messiah Scramble, Kai and Aichi engage Ibuki in a tagfight. In succession the trailer shows Team Q4 and several background characters attending the Messiah Scramble, Ren suffering an apparent defeat, Ibuki and Docking Deleter Graywon, Aichi riding Seeker Alfred and Legioning, Kai and Aichi touching down in an arena against Ibuki, and Alfred battling Graywon. 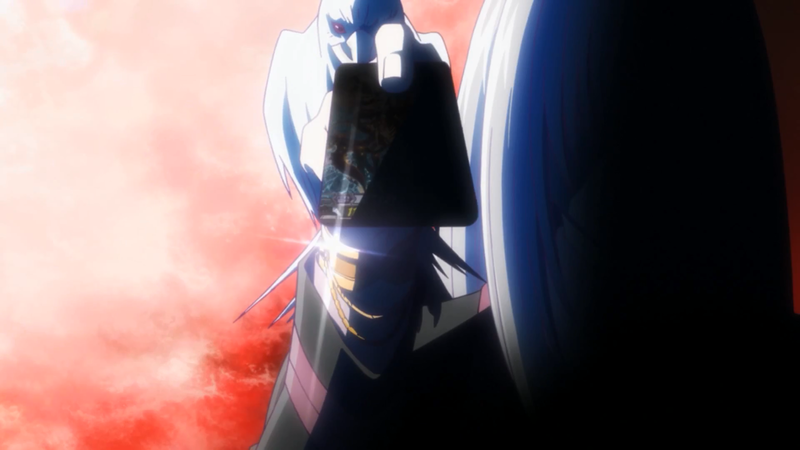 Ibuki's key card is also shown off in several brief shots, with a partial view of its card art revealing that it has no Legion symbol. 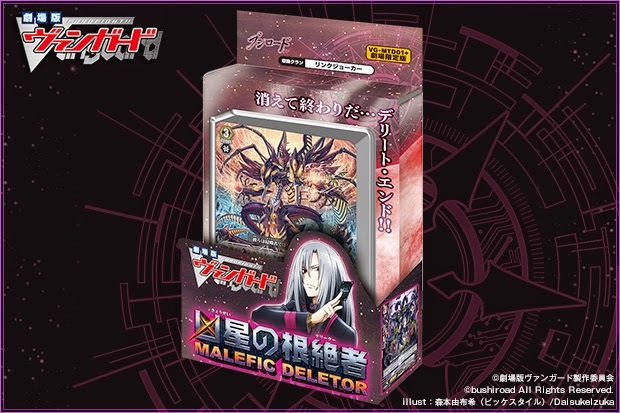 The background of the artwork matches up with previous promotional images for Malefic Deleter, identifying the card as Graywon. Subsequent updates to Neon Messiah's merchandise page have shown that the new grade 3 does not have a limit break or mate, but that its first skill is a main phase counterblast 2 with no other activation conditions. This suggests that Graywon will return to the mechanics of the first season, being able to use its ability as soon as it has the damage to do so. As no official transcriptions have been given as of yet, the name of the new Alfred unit is ambiguous. Aichi calls it as こうげんの探索者アルフレッドエクシブ Kougen no Shiikaa Arufureddo Ekushibu. Kougen has several associated kanji, but a likely written forms of it is 光源 "Light source." Ekushibu has been variously proposed as a corruption of Excalibur ("Exclib") or a phonetic rendition of the Roman numerals XIV "Fourteen." Some have disputed the Ekushibu transcription in favor of Ekusuemu "XM." At this time CFPro will use the placeholder translation "Light Origin Seeker, Alfred XIV." Neon Messiah's opening theme will be an arrangement of OP07 "V-ROAD" performed by a live orchestra. This trailer uses Ultra Rare's latest single "Bravery Flame" as its theme. Neon Messiah will use a combination of hand-drawn and computer generated animation techniques for its fight sequences, blending the appearances of units across two mediums. The trailer is hosted below, with translations. Neon Messiah's PV begins at the 36 second mark. Aichi: Every day we share the same dream. The dream of a wish that I entrusted to Blaster Blade. Caption: The exhibition of the "Messiah Scramble." Caption: Aichi and Kai's tag match!! Aichi: Ride! Light Origin Seeker, Alfred XIV! Seek mate; Blaster Blade! 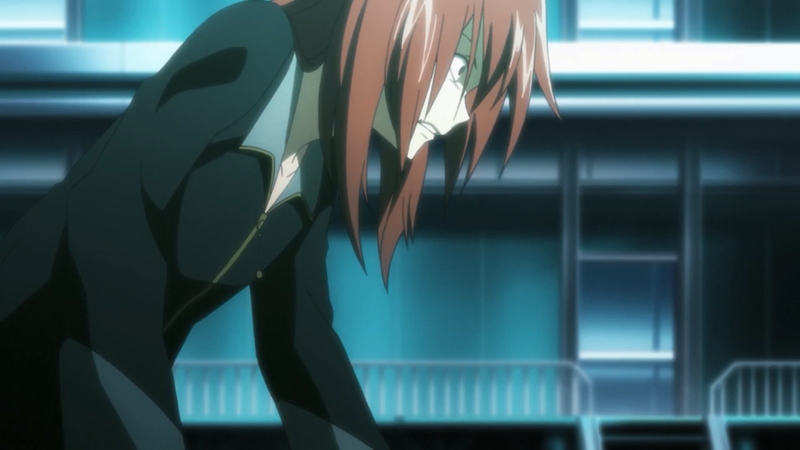 Kai: Ibuki...I will definitely never forgive you! Our bond with our vanguards are not that weak! Caption: Ibuki Kouji's goal is...? Aichi: We will...protect our world, protect Vanguard! Note: Due to the length of the following article and volume of information to be covered, only the first place decklists in today's tournaments are given in full. Bushiroad of Japan announced last Friday that the upcoming Fighter's Climax 2014 winter national tournament will implement Extreme Fight Rules for one of its sub-events, providing an alternative play environment to the current form of competition. Unlike with standard rules, EFR promotes open use of all cards belonging to all clans within one deck, with no restrictions on clan-related trigger activation conditions or skills. The Lord skill, which was once used to prevent the mixing of clans within one deck, is ignored in this format, as are the Fighter's Rules and restricted list. The implementation of EFR in FC2014 was made in light of the release of Extra Boosters 10 and 11, which each promote synergy between the Shadow Paladin and Genesis clans through sharing cards which bear the "Witch" subclan. The winter tournament will also see the revival of the Open class division for the VF Koushien team tournament series, meaning that there will once again be two separate classes of age-based participation for triples competition. 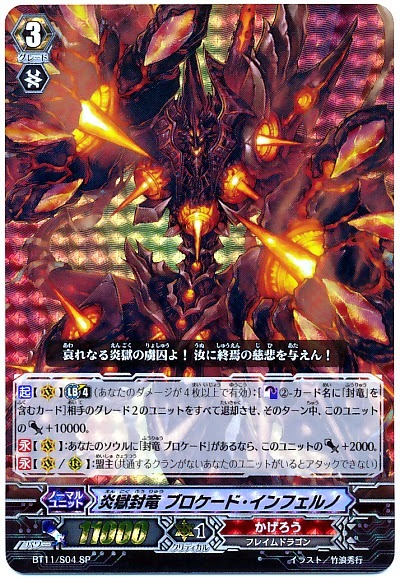 Bushiroad further announced that stocks of the recently-released VG-BT17: Blazing Perdition are completely sold out in Japan, necessitating another print run to meet up with demand. Meanwhile the weekend of August 10th quickly became the one of the busiest for Japan's underground tournament scene, with six simultaneous competitions taking place at Kanazawa, Nagoya, Chiba city, Minamikoshigaya, Tachikawa city and in Fukuoka prefecture. 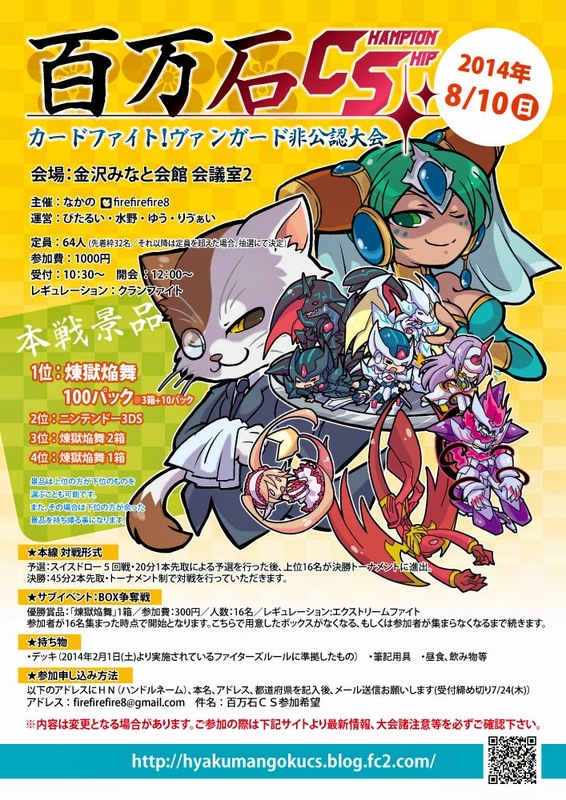 Of these the Kin no Shacchi CS became the first competition that the newly-released Perdition Dragons topped in, while the results of the remaining tournaments border on a caricature of current Japanese tournament play; cardfighters playing Thing Saver-“Abyss” took first place in five large simultaneous tournaments. This sweeping success has led to more intense criticism of Bushiroad's newest restricted list, which saw the restriction of Cat Butler to two copies per deck but did nothing to obstruct Thing Saver-“Abyss” decks. A comparative table of the tournaments and their results is given below. A poster for the Hyakumangoku CS (displayed above) provided a prescient commentary on tournament play, satirizing several of the important cards of the current format. Cat Butler and Miss Mist look down on the current Legion decks, while Revenger Phantom Blaster “Abyss” and Seeker Thing Saver Dragon paired together with their Legion Mates stand on Butler's platter; Star-vader “Ω” Glendios is being pulled up by Rubidium, while Dragonic Nouvelle Vague falls off of the platform alongside Duo Temptation Reit. The VGCS tournaments are a series of unofficial tournaments organized by fans and cardshops. Unlike Bushiroad's larger official tournaments, most VGCS events are done using a best of 3, Swiss tournament model. Turnout is typically 70-80 persons, but some events see 100 or more participants, all of whom compete using pseudonyms and internet handles rather than their real names as in official events. The VGCS model of fan-organized play has begun to gain popularity internationally, with the bi-monthly BeNeLux tournaments serving as their European equivalent, and there are now similar grassroots organizations emerging in the United States like Cosmic Oasis' tournament series and the ongoing King of Cardfight competition in the American midwest. The Hyakumangoku CS had 53 participants, and five Swiss rounds followed by a cut to top 8 for the four-round finals. A video of the finals taken from a viewer's iPhone was livestreamed to the Twitcasting mobile video service, but there is no public recording of it. In order to prevent the kind of Legion-based mixing seen at the Fourth Laketown VGCS, Hyakumangoku's tournament organizers implemented Bushiroad's Clan Fight rules, restricting each participant to playing only a single declared clan, except for Royal Paladin fighters who are permitted to use up to 10 Shadow Paladin cards due to a loophole based on Majesty Lord Blaster's deck requirements. One of the reasons “Abyss” has proven so successful in the deck is because of its role as an opening grade 3 ride. This helps build soul for Thing Saver because both parts of a Legion will move into the soul on-ride, which makes it easier for TSD to restand multiple times while “Abyss” becomes an earlier restand fueled by Mackart and Dark Bond Trumpeter. Although pure Seeker cardfighters have persevered, either sticking to their guns with Sacred Wingal as their supporting grade 3 or by experimenting with the new Light Saver Legion, at this particular tournament they were outnumbered by their Thing Saver-“Abyss” counterparts 8-4. TSA has supplanted actual TS as the definitive Royal Paladin deck of this format. The Kin no Sacchi championship had 42 participants, and is the first victory for Perdition Dragons in the BT17-on format. Tournament champion Veronica's Perditions show many of the same bases and strategies as Nouvelle Vague and Dauntless Dominate from the Link Joker era. This lends credence to the Perditions as not just one of the next major subclans, but also as the next major Kagerou deck as a whole. Further down at the Chiba Brave Cup a similar Perdition deck that integrated Nouvelle support topped on the same principles. Veronica's Perditions display the aggression and control focus of DNV; Menace Laser Dragon fills the role that Nouvellecritic once did, while Bellicosity and Berserk Dragon are retained in their old roles. 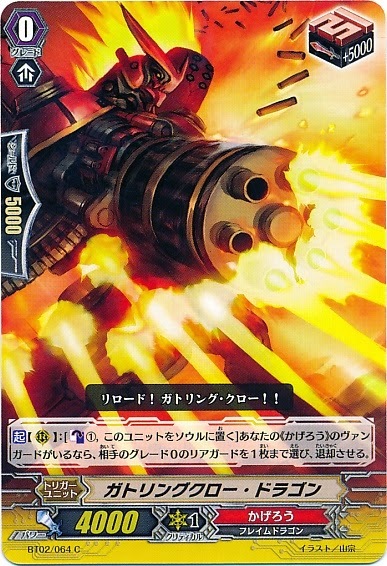 The deck even makes use of Dauntless Drive rather than Pain Laser, the intended supporting grade 3 from BT17. A breakdown of participating fighters' decks is not available. At Chiba there were 92 participants, with TSA and Vortex Dragonewt-DNV in first and second. Asano's Nouvelle deck played three copies of both Dragonic Nouvelle Vague and Vortex Dragonewt, supported by two Dauntless Drive and a playset of Nouvelleroman. Meanwhile Kitsunemaru's Regalia deck ran four of CEO Yggdrasil, three Angelica break rides and two Minerva as a finishing move. Overall the rest of this deck was very similar to the Regalia decks played by Warosu at the third Kansai VGCS, but with a playset of Apple Witch Cider replacing Pure Angel and Ordain Owl in place of Juno. The Third Beast Deity Cup had 55 participants. Fourth place fighter Leviath played a combination of the new Prominence Core and Percival cards in his Gold Paladin deck. Much of the theorizing surrounding the new Liberators has typically included Monarch Sanctuary Alfred as at least a 2-of, owing to the importance of the Link Joker matchup in the BT17-on format. 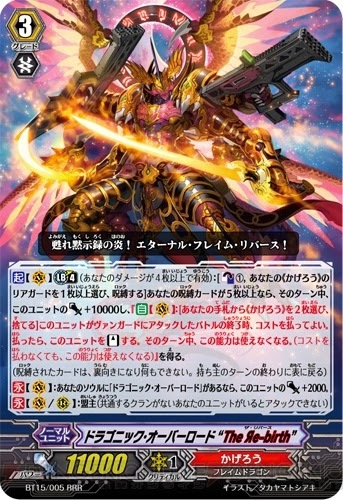 Instead Leviath limited his use of the old Gold Paladins to grade 1 supporting rearguards with on-call skills that would trigger a cascade of different effects through Prominence and Percival. Runner-up Shiimo played a fusion of Dark Zodiac and Garnet Star in his Link Joker deck, with Colony Maker, Opener of Dark Gates and Lanthanum as supporting units. Notably, this deck only used a single perfect defense card, running three copies of Link Joker's new Rejection Dragon Quintet Wall in place of additional Promethiums. As the main feature of the deck, Dark Zodiac is noted for his ability to prevent the opponent's cards from unlocking, which is why some fighters have turned to pairing him with Omega Glendios in order to active the World End win condition; getting to the damage level necessary for this usually requires exposing oneself to an unguarded vanguard at some point, hence it has not caught on in Japanese play compared to pairing Zodiac with Garnet Star or Imaginary Plane. Third place fighter Hyoga's Pale Moon deck was a Cracking Beast Tamer and Miracle Pop build, with vanilla 10000-power units for the rest of the grade 2 lineup. By getting away from the Silver Thorn cards and focusing on his Legion, Hyoga was able to include three copies of Midnight Bunny and Egg Juggler in order to trigger multiple attacks, create pressure lanes and build up card advantage through draw power. 73 participants attended the fifth Tachikawa CS and while Thing Saver-“Abyss” has continued to outshine both actual TS and Phantom Blaster “Abyss” decks, third place fighter Seruru was nonetheless able to make top 4 with an “Abyss” deck of his own. Seruru's Revengers used 4 copies of “Abyss” and 4 Raging Form Dragon, eschewing Masquerade for a grade 2 lineup of Tartu, both Dark Revenger variants and one Mana, which follows the trend set by last months Kansai championship. In a deck where the rearguards largely serve to provide sacrifices for one or two powerful turns with a high-power vanguard lane, independent attackers like Masquerade are not strongly called for because they are not likely to remain on the field for very long. Finally, 40 fighters entered the second Kitakyuu CS, with the top 4 being split between Royal Paladin and Nova Grappler decks. 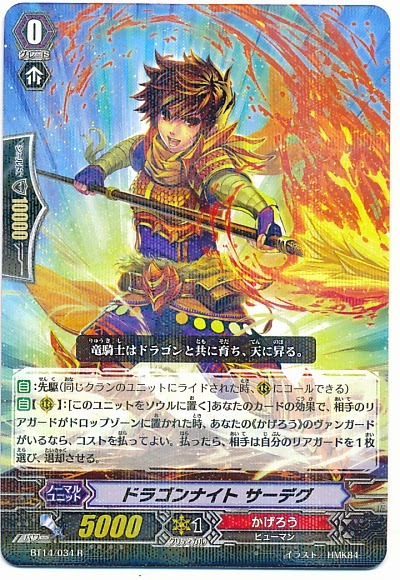 One point that Kitakyuu has illustrated is the overall similarities between the major Legion decks of Japanese play, with certain necessities cropping up in each. Card changing grade 1s--primarily clones of Dragon Monk Gojo but with some Emerald Witch cropping up--are now a necessity in most Legion decks, as are at least one or two Quintet Walls. And while the cards are not completely equivalent in comparison, just as Revenger decks have become heavily dependent on Judgebau into double Swordbreakers to soulblast and build up card advantage in the hand, any deck with access to Luck Bird clones (and in Nova Grappler's case, Street Bouncer) is running them near to or maxed. Conversely the 12000-power attackers of last year are diminishing except when called for by a Legion vanguard. The homogeneity of past formats has not disappeared, but has been channeled into different points. The idea of going into a 96-person best-of-three pro tournament and coming out of it virtually unscathed, undefeated in sets, sixteen wins to one loss was once unthinkable. Many cardfighters struggle just to make it to 16-8 under the same circumstances. It is exceedingly difficult to not give in to some kind of exploitable weakness and have a game taken each round, even assuming that one tops without losing any sets. But this was the story of faruke, one of the first cardfighters to make a strong showing with the grade 4 Dragonic Nouvelle Vague just after Kagerou was hit with Japan's January 2014 restricted list. It was this display which testified to Nouvelle's status as the best deck in format for Japanese professional play, and internationally we are still seeing the influence of this play out in the English-language game. We will continue to see it for some time to come, and both for Kagerou cardfighters seeking to either main Nouvelle Vague or an alternative Kagerou build, and for other fighters intending to compete with other clans it is necessary to fully understand the strengths and weaknesses of Dragonic Nouvelle Vague. Having a Nouvelle matchup is how you compete in 2014, and once you have a way to fight it the rest of your matchups will write themselves. Before proceeding, there are several tools that you should be aware of that make virtually any Kagerou deck better. Some of these go as far back as the very first trial deck; one of the primary reasons that Kagerou has endured for so many years as one of the most competitive clans is because of the massive amount of strong, amorphous support they've received that can be reasonably mixed into almost any deck. Lizard Soldier Conroe is considered the optimal first vanguard for the clan in most situations because being able to pay counterblast 1 and retire him to search for any grade 1 allows you to effectively tech a wide variety of grade 1 units both for their utility and aggression, or simply guarantee yourself a perfect defense card at any time. However, as of August 20th Conroe will be restricted from being placed as the first vanguard. This necessitates the use of an alternative first vanguard, and most fighters default to Red Pulse Dracokid. 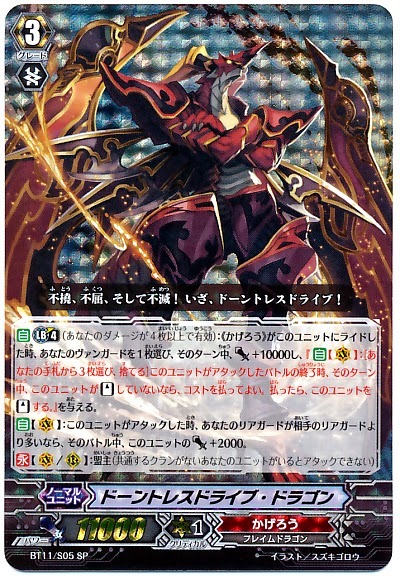 Red Pulse is a grade 3 searcher, counterblast 1 to go into the soul and look at the top 5 cards for a grade 3 or greater Kagerou, and it's his ability to target both grade 3s and 4s that make him useful to nearly any deck. While grade 3 searchers have been criticized for having a success rate in the ballpark of 30%, it's important that their skills shuffle the deck afterwards. If your grade 3 or 4 wasn't in the top 5 cards of the deck then it's foreseeable that you would not be able to ride to that grade on the next turn regardless, so by shuffling the deck Red Pulse tries for a game state where you will draw either of those grades. The primary grade 3 around which most strategies for this clan hinge is the break ride Dauntless Drive Dragon. When ridden over with another Kagerou, Dauntless gives that unit the standard +10000 power boost and a skill that lets you restand your vanguard after it attacks as long as it hasn't already stood before, by discarding 3 cards. Counting both the additional grade 3 you have to ride and that this skill takes away three cards but only gives two back with the second twin drive, overall Dauntless is a -2 and so unlike many break rides will gradually kill you as you ride successively more copies of it, but the intention of the card's design is that the restanding skill be so devastating to the opponent that the -2 is reasonable. You should take more cards away with multiple attacks than you are losing. So you want to be able to break ride over Dauntless just once or twice, then immediately form an effective endgame turtling strategy to secure your victory. The key supporting units that can improve your deck are Berserk Dragon and Bellicosity Dragon. Either of these cards could make or break the effectiveness of another clan alone, and together they're a dangerous combination. Berserk's cost is counterblast 2 to retire an opponent's grade 2 or lower unit, while Bellicosity can unflip a card when his attack hits the vanguard, making him an ideal grade 2 ride since he can effectively compensate for Berserk or Conroe. Controlling the backrow is usually considered much better than controlling the front because retiring backrow units requires the opponent to dedicate exponentially more shield to the field over time where frontrow units can intercept, but situationally you will find it helpful to curb the opponent's aggression by doing things like retiring a 10000-power grade 2 with Berserk's skill and then using him to attack a 9000-power unit in the other lane. Bellicosity keeps the damage zone open and usable, which is more important for Nouvelle than other decks because it is not a deck where you are constantly at limit break-level damage and so being able to budget within three counterblast is a game all its own. A good Kagerou deck will tend to balance between four and six draw triggers with criticals to compensate for a lack of direct searching in a post-Conroe format, and Gattling Claw Dragon is easily their most important draw trigger. Gattling's skill is to counterblast 1 and move into the soul to retire an opponent's grade 0 rearguard, and this is an example of one of the myriad reasons Kagerou has stayed such a consistently good clan over the years. It does more for taking the same actions than other decks of comparable support. Drive checking triggers can be considered one of the many standard parts of a deck existing in play, and in that regard Kagerou does more just by existing than its contemporaries. Gattling increases your card advantage by 1 when you drive check him, then by using his skill next turn you retire the opponent's first vanguard and have a net change of +/-0 compared to their -1. The last important supporting element in generic Kagerou is a card that was intended to be specific to one subclan but because of its conditions can be used in any Kagerou deck. 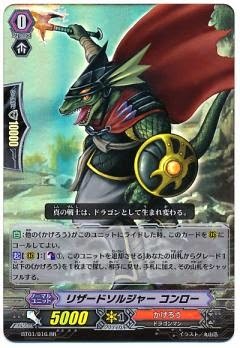 Seal Dragon Kersey is a grade 1 that allows you to discard a card when placed on a rearguard circle if the opponent has a grade 2 on their field. Kersey is considered superior to the clan's other card changer, Dragon Monk Gojo, because Gojo requires himself to be rested to use his skill while you will still get Kersey's boost after card changing. This lets you dispose of excess Gattling Claws or other drive checked cards, concealing your hand from your opponent and trading out less useful units for others of either the same or greater utility. 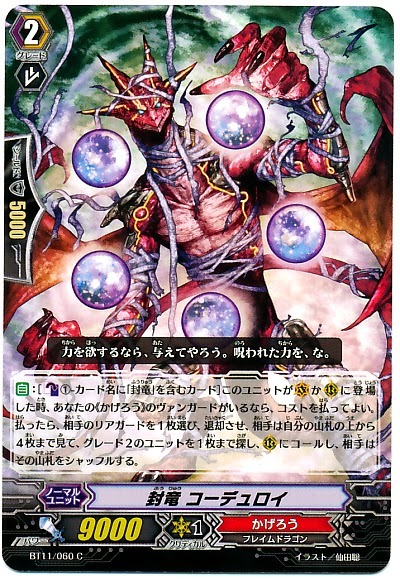 Moving into the cards introduced by VGE-EB09: Divine Dragon Progression, consider Nouvelle himself. Dragonic Nouvelle Vague is the standard by which not just all Kagerou decks in 2014 must live up to, but is the standard by which all professional decks must compete. If you cannot plan for and play against the Nouvelle matchup, you are not ready to be playing in a pro setting this year. Unlike every other boss card in the format, DNV's game is defined not by its limit break but by its innate skills. The unit has been said to remove chance from the game without reintroducing a proportionate amount of skill, and any one of its unique abilities could have easily been a boss card in its own right. When Nouvelle attacks the vanguard it cannot be guarded using grade 0 units from the hand, removing the primary means of defending oneself from the game, and all of the defending player's trigger effects are cancelled during the Nouvelle cardfighter's turn. This means that the benefits of defensive triggers cannot be received, including draw effects, and most importantly if a sixth damage is taken during the opponent's turn there is no way to heal out of it. DNV controlling the ability to defend oneself is easily the most dangerous aspect of it, while everything else is complementary fluff. As a grade 4 unit Nouvelle Vague boasts a 13000 power base, giving defensive power equal to that of a crossride without demanding specific units to be in the soul. Blocking grade 0 units means that even an unboosted Nouvelle requires two cards to be put down for a two triggers to pass defense, but his grade 1 especial booster Dragon Knight Ashgar, makes this a 23000 power total and can be searched as early as turn 2 by Conroe. With any grade 0s in the hand being dead, guard options against such a line are limited to perfect defense, Quintet Wall, or dropping four 5000-shield grade 1~2 units for two to pass. In the rearguard DNV drops down to 12000 power, but Ashgar's boost is applicable to both vanguard and rearguard Nouvelles, making DNV arguably the best overall unit in the deck regardless of where it is placed. Depending on the tempo of the fight however, a rearguard Nouvelle may never be seen. This is because Dragonic Nouvelle Vague's limit break is a persona blast; for counterblast 3, soulblast 3 and by discarding a copy of Nouvelle, all of the opponent's rearguards can be retired. Originally intended as an incentive for Nouvelle cardfighters to run four copies of the grade 4 instead of just two as had been seen in grade 4 playtesting with Epitome of Knowledge Silvest, the persona blast is often regarded as an incentive gone completely out of control. Achieving a total field wipe can make it impossible for the opponent to fight back at all, crippling setup-heavy decks like Aqua Force and Beast Deity builds, and coming back from extremely poor situations with a game-deciding limit break. Rather than considering this skill from an advantage perspective, it may be helpful to look at it from the angle of how many turns it takes to set up a field. It effectively puts the Nouvelle Vague cardfighter ahead one turn for each unit retired. The persona blast is the reason that a gradelocked Nouvelle fighter cannot be said to be totally out of a game, because the moment the skill goes off it puts Nouvelle five turns ahead by destroying that many turns' worth of drawing. Nouvelle's major drawback of not actually being a grade 3 unit that can be ridden from grade 2 can also be partially mitigated with the grade 1 Nouvelleroman Dragon, who can send a Nouvelle Vague into the deck when ridden or called to search for any grade 3 Kagerou. Roman is how Nouvelle Vague has been treated as if it were a grade 3 in deckbuilding, and the biggest wall between DNV fighters and gradelock. Given that each of Nouvelle's attacks blocks grade 0 units, there's inherent synergy between Nouvelleroman, the grade 4 himself and Kagerou's restanding break ride Dauntless Drive. The more attacks Nouvelle gets in per turn, the more attacks the opponent has to block without using grade 0s, pushing them steadily behind in card advantage and working to that key moment when there are nothing but 0s in their hand. Nouvelle's grade 2 lineup is usually rounded out by Demonic Dragon Berserker Kumbhanda and Nouvellecritic Dragon. Kumbhanda is a normal base 8000 grade 2 that becomes an 11000-power attacker if the vanguard has a limit break icon, and is standardized in most Kagerou decks that are not Seal Dragon or purely Dauntless based. Nouvellecritic is more interesting, acting like a Nouvelle-specific Berserk Dragon. 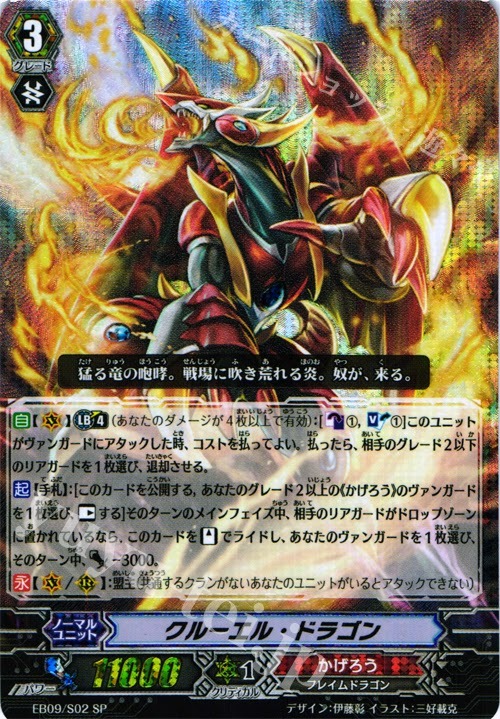 When called or ridden Critic can counterblast 1 and reveal a Dragonic Nouvelle Vague in hand to retire any of the opponent's rearguards, eliminating key units while punishing them for trying to put together a strategy. By conserving more counterblast than Berserk, Nouvellecritic is overall healthier for the progression of Vague's game and keeping the damage zone open, and puts the field control abilities of other decks to shame by giving the deck two different options for destruction. Overall Nouvelle Vague is a powerful format-defining deck that combines overwhelming control over the pace of the game with excellent resource management and hyperaggressive endgame pushes with a restanding vanguard that manipulates the opponent's defense, edging on being the best deck in the format. 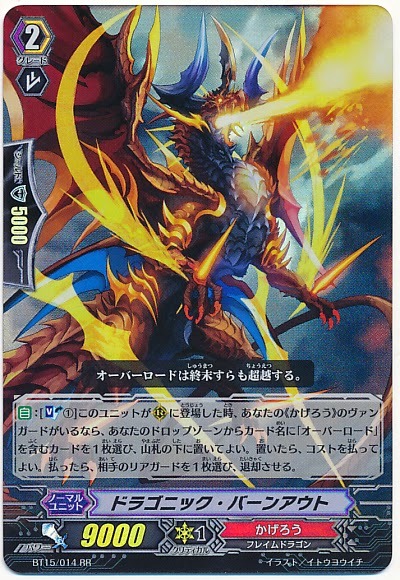 And in its favor, aside from Dauntless Drive most of the Nouvelle deck is compressed into VGE-EB09: Divine Dragon Progression, which greatly expedites assembly. It is far from the only deck worth consideration and faces severe competition from within its own clan, and as the "final boss" of Vanguard defeating it can be its own reward. It does not totally eliminate any particular decks from play as Chaos Breaker Dragon once did, but you cannot build in 2014 without accounting for the Nouvelle matchup. To do so would be like trying to ignore the existence of the sun. Accounting for the clan as a whole Kagerou at present has three options for perfect defense cards split between BT01's Wyvern Guard Barri, BT11's Seal Dragon Rinocross and EB09's Dragon Dancer Maria. Maria is easily the cheapest option among these because of her recent release in an extra booster set, but Rinocross is desirable for Seal Dragon cardfighters because of their need for Seal Dragon-specific counterblast. Divine Dragon Progression has also introduced several alternative grade 3 options. 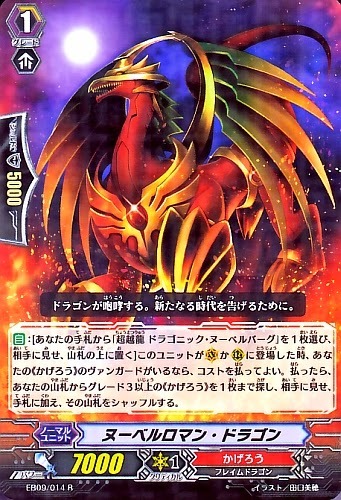 Of particular note is Blast Bulk Dragon, formerly known to his English-speaking fan following as Barky. Like Nouvelle, Barky is considered dangerous even before limit break, because his autoskill gives him +5000 power whenever his critical is two or greater, turning every critical trigger check into two triggers. This makes guarding Barky extremely tricky, because in normal calculations he behaves as if he always has an additional +5000 power over whatever his current swing is. Note that the +5000 power lasts until the end of the turn but cannot be stacked, so if you attack with Barky after break riding over Dauntless Drive and his critical increases then his next attack after restanding will have 26000 power rather than 21000. Barky's limit break is to counterblast 1 and discard a card for +5000 power and +1 critical until the end of the battle, making him a constant 21000 power 2 critical lane. 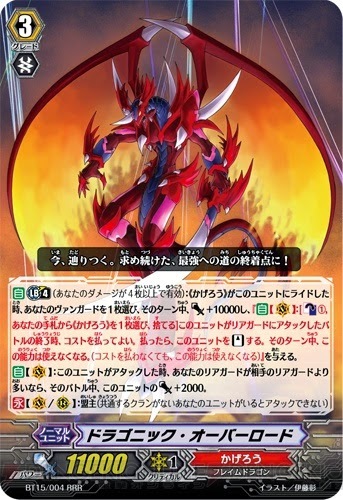 The other new grade 3 introduced by the set is Cruel Dragon, who was originally designed as Nouvelle support and so can either function in DNV or as his own build. Prior to limit break, Cruel's superior ride skill allows it to be ridden by resting your grade 2 vanguard when an opponent's card is put into the drop zone during the main phase, after which Cruel will ride in the standing position but with -3000 power for the rest of the turn. 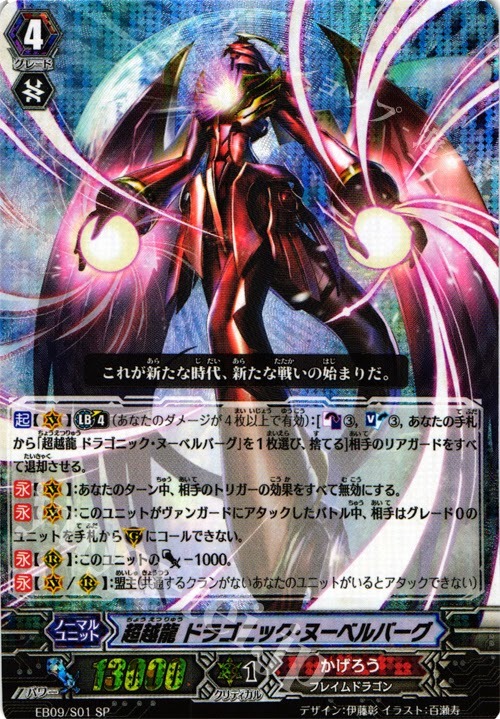 So Cruel will drop down to an 8000 power base to attack with effectively the same power as a grade 2, but with the benefit of twin drive to give an extra card over what is normal for that point in the game. Cruel's limit break is to counterblast 1 and soulblast 1 when it attacks a vanguard to retire an opponent's grade 2 or lower unit, incurring a -1 against the opponent while controlling the field with a cheaper Berserk Dragon effect. The soulblast requirement normally limits Cruel to twice per game, but with Conroe out and Red Pulse in this can increase to three times per game, and it can also work in tandem with Gattling Claw's main phase effect or that of Seal Dragon Artpique. The skill is not as dominatingly aggressive as DNV, but note that if you forego the superior ride it can also combo with Dauntless' restanding skill to retire two cards in a turn and effectively force the opponent to lose as many cards as you do for break riding. Cruel Dragon in the Cardfight!! Vanguard manga. Cruel synergizes well with Nouvelle Vague because you can combo his skill with Nouvellecritic's and ride your grade 4 on the next turn while negating the extra -2 taken from riding one more unit than normal with his early twin drive. This is how Nouvelle was originally designed to be run prior to Dauntless Drive's design, and it allows you to secure your grade 4 ride a turn earlier. For this reason many diehard Japanese cardfighters have sworn by their Cruel Dragon techs even in builds that do use Dauntless Drive, because Nouvelleroman makes a single copy of Cruel so easily searched that it lets the deck adjust as necessary for the pace of each fight. A direct competitor to DNV exists in VGE-BT14: Brilliant Strike's Dauntless Dominate Dragon "Яeverse," which is more field control-centric than Nouvelle with less opportunity to be gradelocked at 2 but in exchange a less stable 13000 base. Being one of the units that was Яeversed by the invading forces of Link Joker, Dauntless Dominate's strategy is based around temporarily sacrificing one's own rearguards by locking them in order to gain overwhelming power. Like most crossbreak rides, Dauntless "Яeverse" has strong breakride synergy. Once per turn during the main phase, his limit break 4 locks one of your own rearguards to receive an autoskill, so that when he drive checks a grade 1 or greater Kagerou during the battle phase one of the opponent's grade 1 or lesser rearguards can be retired, and Dauntless Dominate receives +3000 power. Acting like the new and improved Dragon Monk Goku, Dauntless "Яeverse" compensates for poor trigger checks by turning them into good ones, getting "half a trigger" in power whenever he checks a nontrigger units and giving the opponent a -1 in card advantage. With Dauntless Drive's breakride skill you can simply sacrifice Dauntless' booster for the lock cost, and being able to restand for that turn means getting twice the chances to retire the opponent's rearguards. After potentially taking out 2~3 units and powering up your own with trigger checks, you can then go into a defensive game with his 13000 base when the opponent's field is already crippled and not well prepared to make lanes that can even hit the vanguard, much less create 18000 power lanes. This is one of the best ways to contend against both Nouvelle and Chaos Breaker in the current format, as assaulting the opponent's field is one of the few ways to reliably deal with either deck. Dauntless "Яeverse" is thus one of the strongest contenders within the clan for the Kagerou throne, and his bevy of support from BT14 assists that. In particular DDЯ does not make use of the soul, which opens the door towards a playset of Calamity Tower Wyvern. Introduced in the same set, Calamity Tower is a Luck Bird clone that can soulblast 2 when called to draw a card, building advantage and making him into a safe lock target. DDЯ also has room for an alternative first vanguard to Red Pulse, Dragon Knight Sadegh. Sadegh's skill places him into the soul when an opponent's unit is retired, and in exchange forces the opponent to retire another of their rearguards, which when combo'd with DDЯ's limit break and Calamity Tower over two turns can make a net change of +/-0 on your end to the opponent's -3 cards. 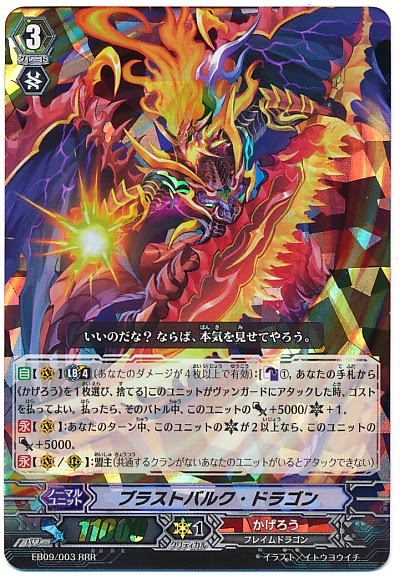 Berserk Dragon can also capitalize on Sadegh, but as counterblast is important in this build and DDЯ has his own grade 2 subclan attacker in Dominate Drive Dragon, space may be too tight for this particular combo. The Seal Dragons are the corner of Kagerou that is in the most need of renovation. Made up of prisoners from Kagerou's Magma Prison temporarily put on parole in exchange for fighting the Link Joker invaders, the subclan has the bare minimum of grade 1 and 2 subclan attackers and unique skills at every grade, but lacks a strong core grade 3 lineup and suffers from needing Seal Dragon-specific counterblast in a deck that is mostly not Seal Dragons. Their first vanguard is Seal Dragon, Terrycloth. Once a revolutionary that rebelled against the empire, Terrycloth in his sealed form has had his body and magic rewound three thousand years. While that seal is in theory indefinite and meant to assist a life sentence, Terrycloth still has access to some of his magical power. His especial counterblast places him into the soul, then retires an opponent's rearguard; the opponent can then look at up to four cards from the top of their deck and superior call 1. Note that even if the opponent chooses to look at up to zero, they still have to shuffle their deck, so this ruins the deck stacking strategies of Tsukuyomi and Mandalalord. Also note that Terrycloth is the key to a specific Seal Dragon combo. The majority of Seal Dragons specialize in retiring units for cheaper costs than standard Kagerou cards would pay to retire any unit, attempting to pay less and then gamble that the opponent does not get a grade 2 off the top of their deck. These cards can retire any unit, allowing you to force the opponent to replace a grade 0 or 1 in a boosting position with a grade 2, which locks up their field. Furthermore, the Vanishing Field skill of this deck's key card prevents the opponent from intercepting, which completes the lock by forcing them to guarantee you a cheap retire by removing the grade 2 that your skill called. 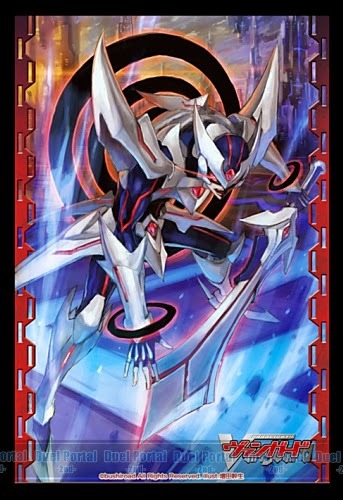 The point to be wary about with Seal Dragon retire skills is that they will also activate "when this unit is called" autoskills; so you could for example, end up superior calling a Blaster Blade that then retires one of your units, or a Nemain that reinforces the opponent's hand, or even end up helping the opponent to superior ride on your turn by calling a Lop Ear Shooter that they then combo with Pellinore. There's a lot of risk involved with sealed magic, and part of the reason that the magic of these cards is forbidden in the first place is because it operates in a completely different way from every other skill type in the game. Corduroy is the star of this build's grade 2s. An insane dragon, Corduroy was dissatisfied with run-of-the-mill dragon magic and turned to investigating the cursed black arts to feed his unending greed. 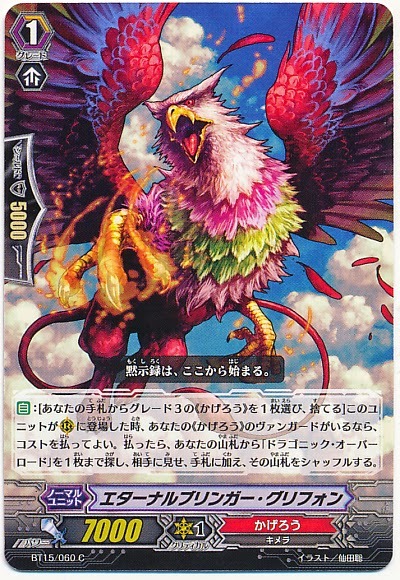 When called or ridden he can counterblast 1 Seal Dragon to retire one of the opponent's rearguards, and from there the skill operates exactly the same as Terrycloth. This is important because while Terrycloth interacts as turning your advantage from +1 to 0 to either give the opponent a -1 or -0 with weaker field setup, Corduroy is always a -1 or -0 to the opponent without giving an inherent loss to your own advantage. The vanguard that once served as the basis of the deck is Seal Dragon, Blockade. While he only has a 10000 power base in a clan of 11000-power units, Blockade's Vanishing Field stops the opponent from intercepting during your own turn. Blockade himself has two forms. 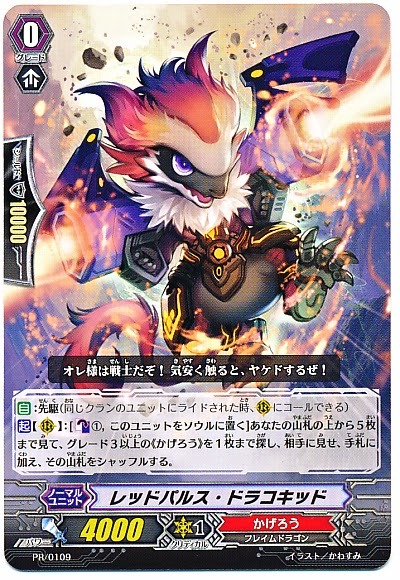 In his sealed form the Vanishing Field can only be momentarily expressed, but VGE-BT11: Seal Dragons Unleashed opened up the ability to unseal the original Sealed Dragon. In his crossridden form as Hellfire Seal Dragon Blockade Inferno, his cursed magic runs wild and the Vanishing Field with that. Inferno's limit break is to counterblast 2 Seal Dragons, then retire all of the opponent's grade 2 rearguards and get +10000 power until the end of turn. The setup that has been established thus far is to use Terrycloth and Corduroy to retire the opponent's grade 1 and grade 0 units, replacing them with grade 2s that help lock down the field, then keep them trapped there with Blockade. After crossriding Blockade Inferno, you then take advantage of this through his especial counterblast to destroy those units that you locked into the opponent's field, giving them up to a -3 in a good game and potential field wipe on the extreme end. 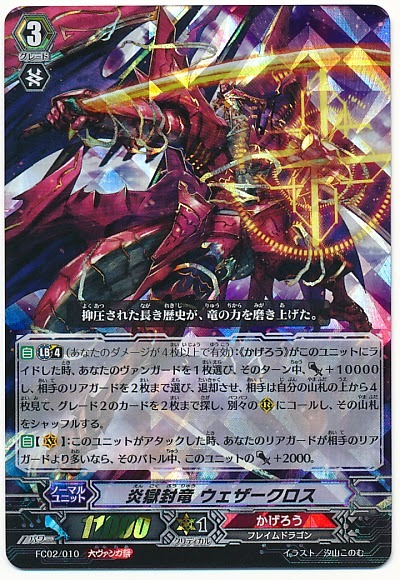 VG-BT14: Brilliant Strike brings with it both a new grade 2 for the Seal Dragons and their Lock Break campaign promo, Seal Dragon Georgette. 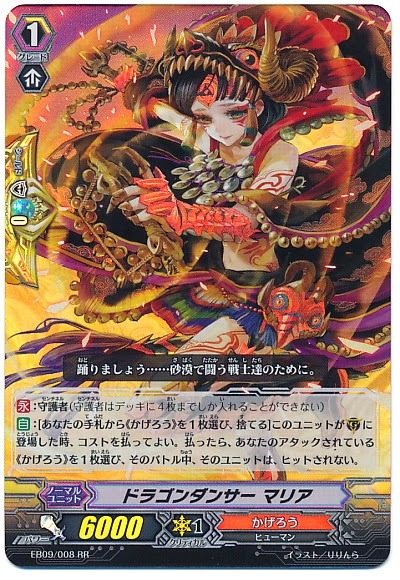 Prior to limit break Georgette has a main phase counterblast 1 to unlock one of the rearguards, carving out a specific and somewhat redundant niche for Seal Dragons as the anti-Link Joker branch of Kagerou. While DNV already overwhelms Chaos Breaker handily, both CBD and the upcoming Glendios have terrible matchups with Georgette because he effectively makes any reductions in CBD and Glendios' advantage permanent by making all of the cards they discarded and put into the soul to lock, relock and omega lock units wasted and shuts down both limit breaks for cheap. Meanwhile Georgette's limit break automatically gives him +5000 power for each of the opponent's grade 2 rearguards when he attacks the vanguard, and an additional critical if they have two or more in play. This puts Georgette on par with Barky for being a strong power and critical boss card, and further cements his status as an anti-Link Joker unit by making him into a devastating independent swing. 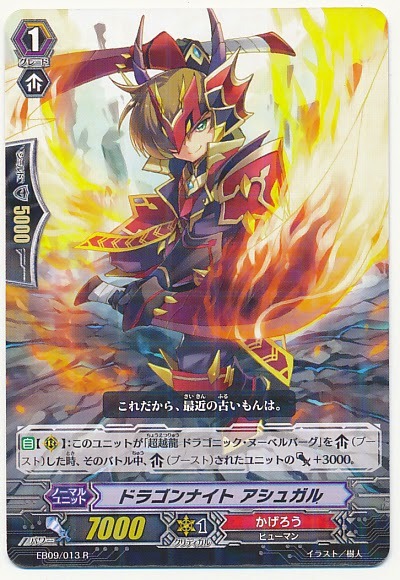 The grade 2 Flame Star Seal Dragon Knight is considerably less impressive, counterblasting 1 when called to prevent the opponent's units from intercepting. It is important that Seal Dragon Knight does not require Seal Dragon counterblast to use his skill, and with the original Blockade potentially out of the deck in favor of Georgette blocking the opponent's intercepts is a useful way to keep grade 2s around to activate the deck's other skills. In December VGE-FC02: Fighter's Collection 2014 is to introduce their next major boss card, Hellfire Seal Dragon Weathercloth. Weathercloth's breakride skill is to give the vanguard +10000 power and to retire two of the opponent's rearguards when ridden, with no counterblast cost. The opponent then looks at the top 4 cards of their deck for up to two grade 2 units and calls them, and because this is only two checks from four cards rather than two checks from eight, they are much less likely to be able to hit two replacements than they would with Corduroy or Terrycloth. Weathercloth and Georgette are the kind of boss cards that Seal Dragons need. In conjunction with Blockade Inferno's limit break he creates a 31000 power center lane and has the potential to completely wipe their field, for effectively 2 counterblast and a -1. With Georgette, Weathercloth makes up for the lack of direct retiring attached to Georgette himself and strongly supports his own innate skill, making a center lane in the range of ~36000 power 2 critical before boosting and ~43000 afterwards. The main problem with the Blockade Inferno build at this time is whether or not his skill is enough to finish the opponent off and reign the game in. Arguably other late-game power pumps like Gancelot Zenith and Dragruler Phantom do even less than this the further the game goes on, so many fighters would say that this is enough to put Seal Dragons in contention for DNV's throne, but Georgette provides them an extra boost that helps define them in a different direction and in that way compete. On September 19th we're due for the release of VGE-BT15: Infinite Rebirth and the rise of Kagerou's second Яeverse card, Dragonic Overlord "The Яe-birth." While the cornerstone of the deck is a restanding strategy, unlike Dauntless the goal of "The Яe-birth" is to fight totally alone by sacrificing the entire field to stand as many times as possible and rack up multiple trigger checks. "The Яe-birth's"limit break 4 is to counterblast 1 and lock Kagerou rearguards until you have five locked cards in play; this gives DOTЯ +10000 power and the ability to restand by discarding two cards after it attacks the vanguard. In combination with a break ride this guarantees DOTЯ a 31000 power base to work off of and six drive checks, and is equivalent to giving the entire field twin drive. 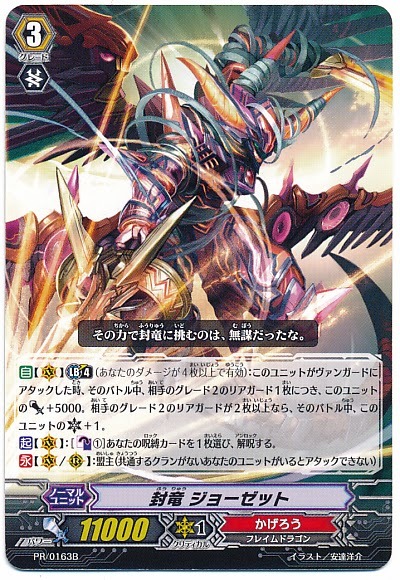 Dragonic Overlord "The Яe-birth" is one of the only cards in the game to be both a crossride and a crossbreak ride, as there are two cards that qualify his continuous +2000 power. 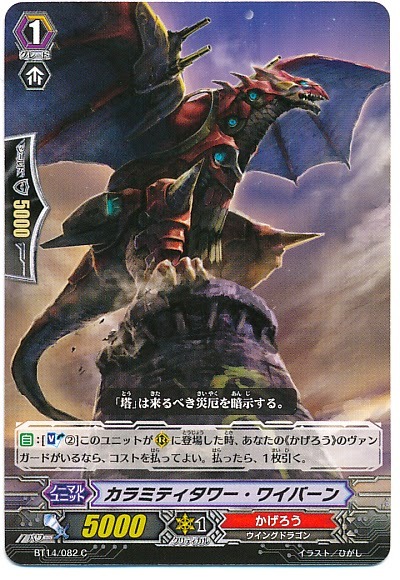 The first is the original Dragonic Overlord introduced in VG-TD02: Raging Dragon of the Empire and VG-BT01: Descent of the King of Knights, but the second is a new break ride with the same name introduced by BT15. 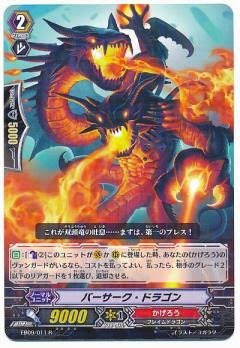 Like many alternate break rides given to other clans, the break ride incarnation of Dragonic Overlord comes with a counterblast 1 cost attached, but the timing for it is unorthodox. When ridden, Overlord gives the vanguard +10000 power and an autoskill which allows it to counterblast 1 and discard a card after attacking a rearguard to restand. 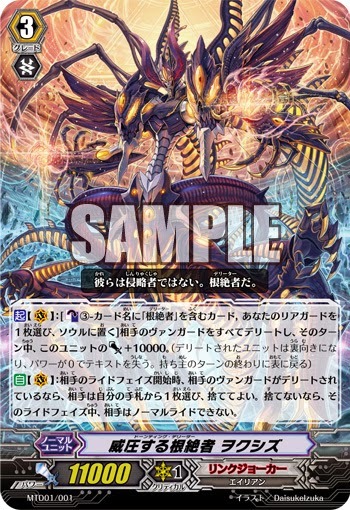 So while DOTЯ's restand is an exchange of +0/-0 whose effect on the game is wholly dependent on how heavily it damages the opponent's defense, break ride Overlord's is a +1 that negates the -1 of riding over him, but also incurs a -1 against the opponent to work the individual battle in your favor. 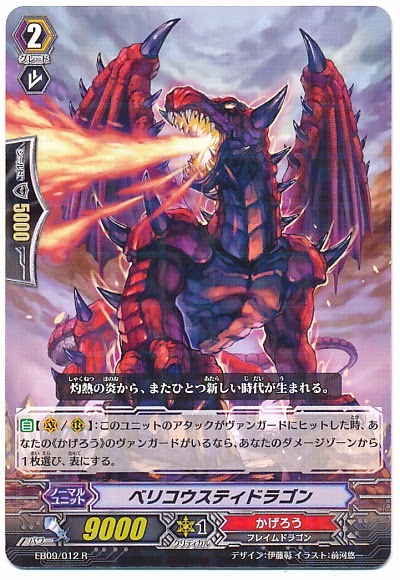 There was once some debate among "The Яe-birth" cardfighters regarding whether it would be better to run DOTЯ with Dragonic Overlord or to forgo the crossride entirely and use Dauntless Drive to get in three attacks against the vanguard, but the final print of "The Яe-birth" prevents its skill from being used if the cost was not paid after it attacks. The break ride reimagining of the original Overlord has other consequences. While it doesn't synergize well with Seal Dragons, who are likely to not have an opposing frontrow to attack, one of the noted features of the new Overlord is that it makes the old standby Dragonic Overlord the End into a crossbreak ride. DOTE's persona blast is a familiar element to the game, restanding it whenever its attack hits, and this has been historically devastating when used in combination with Dauntless Drive Dragon because it puts the opponent in a world of bad decisions, but the new Overlord is a strong improvement by returning his defense to him and enabling his skill to be more powerful than ever. While neither DO nor DOTE have stipulations demanding that they must not have stood previously, their skill interaction is made more complicated by sensitive timing. Overlord's break ride skill only activates when the broke ridden unit attacks a rearguard for the first time; if the cost is not paid and the vanguard restands by another skill, then like with Galaxy Blaukluger because of the clause "(Even if you do not pay the cost, this ability cannot be used for the rest of that turn.)" Dragonic Overlord's skill will not be usable. So while the End and Dragonic Overlord's skills may both be used in the same turn, they must proceed in the order of Dragonic Overlord followed by the End even if their first attack is not defended. What this means is that the best option for the opponent is also the scenario in which they lose the most cards, no-guarding the rearguard attack and then dropping a perfect defense or greater when the End's next attack comes down. If the opponent chooses not to guard the End's second attack then they are conceding to staring down a third vanguard attack in addition to the still-standing rearguard lanes and giving DOTE a +1 where "The Яe-birth" merely breaks even. 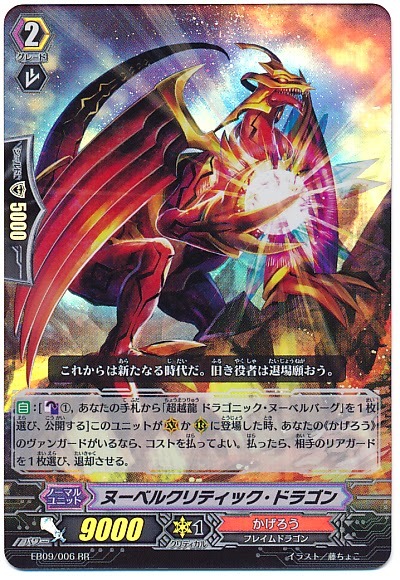 Dragonic Overlord as a break ride thus solves the problem faced by Dauntless Drive Dragon, that the exchange was 'solved' by being at two to three damage. Versus a crossbreaken the End, it's better to be at higher damage and a later stage of the game that justifies dropping a perfect defense than at lower damage where one is enabling the additional drive checks. At low damage it becomes a paradoxically necessary play for the End's opponent to let their rearguard go and allow the End to hit so that they only guard the last attack that DOTE makes on that turn, giving the End an overall +1 and the opponent a -3. The alternative is losing out on limit break during a crucial endgame stage of the fight, giving the Overlord fighter more time to recover and going into their next turn still at lower damage and still vulnerable to the End's persona blast. DOTE's midgame vanishes more quickly the sooner its attack hits. The chief problem for all Overlord decks is that their strategies peter out after their break ride turns. This is more of a problem for the End than it is for "The Яe-birth" because the End becomes a vanilla crossride once his counterblast is spent. "The Яe-birth" can still repeat his limit break each turn to make two 23000 power attacks, preserving quality over time and scoring multiple drive checks, but faces problems with gradually approaching a deck-out the longer that the game drags on, and that his limit break may not always be superior to simply attacking with three lanes instead of one twice. "The Яe-birth" also has a notably poor matchup against Star-vader “Ω” Glendios because its requirement to lock all of the rearguards can walk right into Glendios' alternate win condition of having all of the rearguards locked, but only if Glendios reaches its main phase with five damage. Because DOTЯ does not make use of its rearguards very much, a Glendios cardfighter at four damage is liable to be trapped that way for the rest of the game, as the DOTЯ fighter will not be putting them to five with their rearguards. The matchup is thus not as bad as it may appear initially, although it is important to note that if all of the rearguards remain locked through Glendios' omega lock skill, DOTЯ may not use his limit break because at least one rearguard needs to be unlocked before the cost is paid in order to initiate it. BT15 introduces two cards that support Overlord units directly. Eternal Bringer Griffin is an updated Doom Bringer Griffin, reimagined as a grade 1 that can discard any Kagerou grade 3 to search the deck for a card named Dragonic Overlord and add it to hand, helping to secure your vital break ride turn. This also connects to the skill of Dragonic Burnout, another modified Berserk Dragon. Burnout's skill is to soulblast 1 when called and return any Overlord from the drop zone to the bottom of the deck to retire an opponent's rearguard. Like Nouvellecritic, there are no restrictions on Burnout's possible targets. 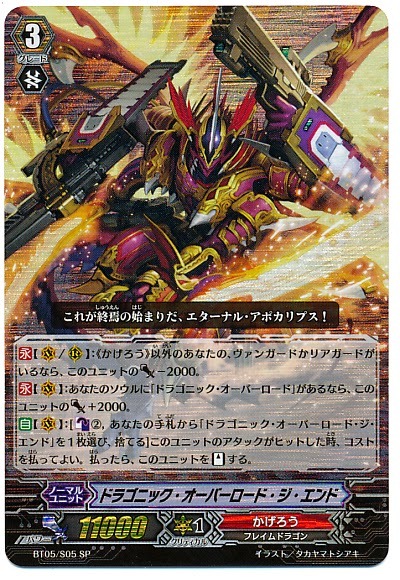 This helps support a stronger endgame for the End after its break ride turn is over, capitalizing on his crossride defense by destroying the opponent's 18000 power lines and protecting the vanguard while the opponent struggles to recover from being crippled by the break ride turn. The overall goal of "The Яe-birth" is to use the entire field as a tool to support the lone vanguard, making great use of Calamity Tower Wyvern, Dragonic Burnout, Gattling Claw and Berserk Dragon and then locking all of them to initiate a strong crossbЯeak ride turn that exhausts the opponent's defenses with its restanding strategy. While it has never been as dominant as Nouvelle, the various Overlord decks are strong contenders and have even seen mixed play with Nouvelle in Japan's post-Legion format as an effective means of piggybacking the old deck. While Kagerou has always been one of the most well-supported clans, 2014 has a much stronger showing of support over previous years, and the rise of the Legion format in 2015 will mark a temporary dry spell for them until the arrival of the Perdition Dragons in BT17. With at least five distinct decks available that each occupy their own place in professional play, the clan is one of the best choices for cardfighters in 2014, both casual and competitive.